Crew just isn’t for the boys. 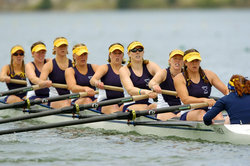 In fact, women’s crew has been very successful at Ithaca College. In 2005, the women’s crew became the first to repeat as NCAA Division III Women’s Crew champions when they won their second straight title at the NCAA Championships at Lake Natoma, California. Nick Alvarez '10 pulls a first place finish in his heat at the World Indoor Rowing Championships in Cambridge, MA. The erg is simultaneously a rower’s primary training tool and worst nemesis. It simulates the rowing motion while keeping the rower stationary. Practice involves rowing pieces ranging from 500 meters (roughly 1:40 in length) to 15 kilometers (less than an hour). The ergometer emphasizes the pain of rowing without providing the pleasure of movement. 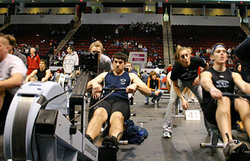 My friends and I recently traveled to the World Indoor Rowing Championships in Cambridge, Massachusetts. The 2,000-meter event was fun, painful, and a great way to prove how we all improved over the course of winter training. Read more about Ithaca's crew teams in ICView, Ithaca's magazine for alumni, parents of current students, employees, retirees, friends, peers, and neighbors of the College. It’s below freezing on the lake at seven o’clock in the morning, but sweat still streams down my face and into my eyes. My breath is short and labored. My legs and arms are screaming for me to stop, and my brain agrees. Still, I push on backward through the mist and cold, heart in overdrive. Why do I do this sport again? Rowing is a backward sport. Predawn practices. Months of training for six-minute races, races in which you can only see who you are beating, not who is beating you. But my teammates and I love it. It’s a mix of teamwork, dedication, and hard work. I played ice hockey in high school but never considered myself an athlete. I liked to run and work out but didn’t have the coordination for soccer or basketball. At Ithaca, I decided to give crew a try after seeing a poster. I’m tall and skinny, I thought. So are rowers, right? It turns out the Ithaca crew doesn’t fit any stereotypes. There were guys of all heights and weights and physical abilities. I found majors from every school. Most of the guys had never rowed before college. Rowing is a great sport for novices. Everything I needed to know -- rigging a boat, rowing technique, and so on -- I learned in the first few weeks. Rowers spend their entire lives trying to perfect the same stroke. A funny thing about rowing is that the people who make it look easy are the ones who are best at it. On television, you don’t see that the boat has to be balanced, that pulling the oar through the water is difficult, or that the crew must keep a precise rhythm. All these things take practice, and lots of it, which means getting on the water before sunrise, rowing in bitter winds and frigid waves, completing long runs and workouts in the weight room. Crew is a time-consuming sport, but rather than complicating my life, it provides a schedule with which to plan my day and my assignments. Crew also takes a huge physical commitment. Workouts are difficult and leave you exhausted, but satisfied. The most important aspect of crew, however, is the camaraderie. Crew is the ultimate team sport. In hockey there are substitutes to cover you if you aren’t playing well. In crew you are committed to every piece. You have to trust and be trusted by the seven other rowers in your boat. Camaraderie begins during winter training, which consists of eight practices per week, running, weight lifting, and rowing on the ergometer, or erg. In winter the training is largely individual, but knowing the team is counting on you keeps you going. I have never felt such a sense of belonging; not only are these guys pushing you, but they are pushing themselves -- there is something special and motivating in the mutual experience of pain and effort. While many people relax over spring break, rowers train harder. Both the men’s and women’s teams go to South Carolina for twice-daily practices on the water. After three months erging, the water is a relief. There is nothing comparable to the feel of a boat cutting through the mist as the sun crests the distant trees. That calmness and tranquility exists even amid the frenzy of a race. Then comes the spring race season. It is in the spring that teamwork is most important as eight guys and a coxswain (who sits in the stern of the boat and gives the crew commands) balance the boat and make it move. In a boat, every member contributes to a goal that is larger than the individual rowers. Crew’s greatest reward is the pain of a race and the glory of a win. But it takes supreme mutual trust. Once trust is established, it translates into brotherhood even off the water. Once concentration is found, the mental challenges of school become easier. Once balance is found, a rower can more easily find balance in life. It unifies life, giving it structure and a great sense of purpose. That is why I row. 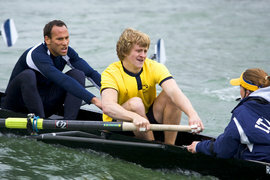 The Ithaca College men’s rowing team was formed in the fall of 1968. The team’s first competition was in 1969, which they won over Manhattan, Canisius and Buffalo in the Metropolitan Championship in New York City. Other titles followed in the 1970s and beyond, including medals at the annual Dad Vail Regatta, recognized as the small-college national championship, where the Bombers accumulated four varsity and 14 additional medals. In the late 1980s, Ithaca entered into lightweight rowing, finishing in the top 10 at the Dad Vails in each of their first 11 years. The team is currently coached by Dan Robinson, a 1979 Ithaca College graduate. In 1993, under Robinson, the Bombers moved from the Dad Vail Regatta to the ECAC National Invitational Rowing Championship. Bow: The front end of the boat. Catch: When the oar first enters the water. It also refers to the position of the rower's body at the beginning of the stroke. Crab: When the oar gets caught in the water and is forced from the rower's hands due to a rower entering the blade into the water without squaring it. Coxbox: The electrical instrument used by the coxswains that automatically counts the minutes, the rating, and the number of strokes taken. It is equipped with a microphone connected to speakers so the rowers can hear the coxswain's cadence. Coxswain: The person -- who does not row -- responsible for steering the boat, keeping track of the stroke rate, time, rhythm, race strategy, and motivation. Finish: When the oar releases from the water. This also refers to the position of the body at the end of the stroke. Head race: This is a race held in the fall, and typically lasts about 20-25 minutes over a roughly three-mile course. Keel: The centerline of the shell. Refers to the extent to which the boat is balanced from side to side while rowing. Oar: The equipment that is used to propel the boat. Port: The left side of the boat, usually noted by the color red. Rudder: The steering device at the stern. Sculling: Each person rows with two oars. Skeg: A small fin located along the stern section of the hull that helps to stabilize the shell in holding a true course when rowing. Slide: The track on which the seats move. Squaring: A gradual rolling of the oar blade from a position parallel to the water to a position almost perpendicular to the surface of the water. Starboard: The right side of the boat, usually noted by the color green. Stern: The back of the boat, where the coxswain normally sits. Stroke: The full rotation of the oar in and out of the water. Sweep: Rowing with only one oar (as opposed to sculling). Swing: The rhythm of the boat moving in unison.